Owner Lyneen Burrow learned quilting as a child. She had an opportunity to open a quilt shop in 2007 and jumped on it because she wanted to create a space for women to socialize. A place where there is laughter, a hug and a cup of coffee for everyone who walks through our doors. 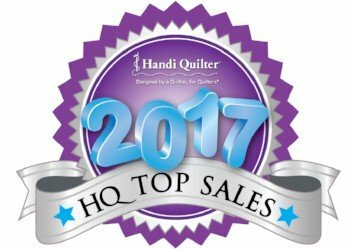 Her goalis to encourage people to start, continue or return to quilting and needle crafting through top-quality products, education and advice while keeping the crafts affordable to all. The shop has grown over the past 12 years, adding services and more fiber arts. We have an on-site repair technician to care for machines; longarm quilting service and training on the longarm so customers can use our longarm to quilt their own quilts. As we have grown, our class offerings have expanded also. While making sure to keep an emphasis on beginning level classes, many of the classes still hold value for more advanced quilters, knitters, and other needle crafters, as well as the occasional specialty craft. Several ways our customers have been encouraged to make a difference are by donating a specific item for a particular cause. We've collected hat and glove sets, Project Linus blankets, ConKerr Cancer pillowcases, heart pillows and chemo caps for the local Women's Center, and backpacks for the free clinic helping outfit kids for back to school. We have customers who continue to bring knit baby hats for preemies and for the Little Hats Big Hearts campaign, and scarves for Knit Your Bit, which go to our local VFW. Can I buy a Gift Certificate on-line? Absolutely! The Gift Certificate module is at the bottom of the shop page. No, our shop sells crafting supplies. We can recommend several local businesses, though. Can you do the quilting for me? Yes! We do an all-over meander design. For custom quilting (designs in certain areas of the quilt) we refer our customers to two local quilters. Can you repair my sewing machine? 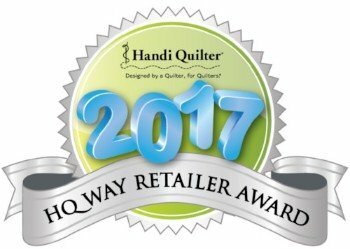 We have a repairman in the shop who works on all Janome and Handi-Quilter machines. He also works on machines of other makes less than 30 years old. If you are uncertain, call our shop and we can tell you if he is able to work on you machine. Will you embroider a name on my jacket? We sell embroidery machines, but we do not do embroidery services. We do have a list of people who provide that service. If I bring my grandmother's quilt in, will you tell me how to fix it? We can try. We have put several links on our links page with suggestions on cleaning and storage of antique quilts. In the shop we have many old quilts, and some have repairs we can show you for ideas. If I bring in my quilt, how big does the backing need to be? Your backing should be 6" bigger than the top on all four sides, so 12" longer than each side measurement. Can I just use a sheet for the backing? No. The thread count on a sheet is very likely different than quilting cotton. This can affect shrinkage once the quilt is washed. What is the best backing for my quilt? Quilt stores offer backing in 108" widths. It is high quality cotton, and because it is 108" wide, you will only need half as much in most cases. If you do use regular 44" quilt cotton and seam it, please trim the selvage off before seaming. 100% cotton is the best fiber for quilt backing. If the top is made of cotton, the back and top will wash the same, and quilting will come out more uniform than if other fibers are substituted. why does my batting have to be bigger than my quilt top? During the quilting process, the batting pulls in with the stitching. There is no feeling like coming to the end of the quilt and being 1" short of batting. We do! We have a specific form you need to fill out. Please allow one month for processing.